The most common cause of isolated oculomotor nerve palsy is microvascular infarction which is caused as a result of diseases, such as diabetes mellitus, hypertension, atherosclerosis, and collagen vascular disease and is pupil-sparing. Another common cause of isolated oculomotor nerve palsy is direct compression by an intracranial aneurysm, usually an internal carotid-posterior communicating artery aneurysm and tumors that presents as oculomotor nerve palsy with pupillary involvement. Sometimes, pupil-sparing oculomotor nerve palsy can be an early symptom of enlarging aneurysm. Cryptococcal meningitis presenting as only isolated oculomotor nerve palsy with pupillary involvement is rare. Here, we report an immunocompetent patient who presented with isolated oculomotor nerve palsy with pupillomotor palsy and was found to have cryptococcal meningitis. 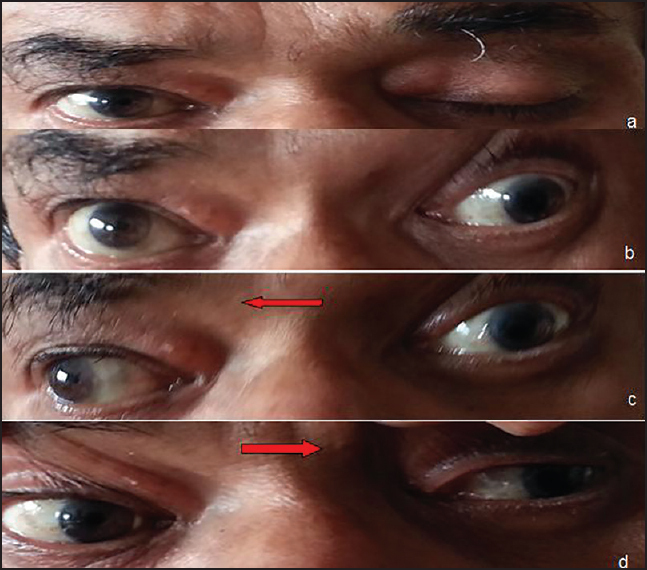 A 64-year-old gentleman presented with history of inability to open left eye of 1-day duration. This was sudden in onset and not associated with pain, and no headache, eye pain or redness, and vomiting. Patient was known hypertensive since 2 years on medications and no diabetes mellitus or other comorbidities. On examination, vitals were stable; he was conscious and oriented. Visual acuity and fundus examination were normal. There was complete ptosis of left upper eyelid with restricted medial horizontal and vertical gaze in left eye. Left lateral gaze was preserved. Pupils were 3 mm, nonreactive to light [Figure 1] and [Figure 2]. Facial sensation and other cranial nerves were normal; and no other localizing or lateralizing deficits and no nuchal rigidity. Complete hemogram and renal, hepatic, and thyroid function tests were normal. Glycosylated hemoglobin was 6.6%. Serological testing for antinuclear antibody (ANA), human immunodeficiency virus (HIV), hepatitis B virus (HBsAg), and venereal disease research laboratory (VDRL) were negative. Magnetic resonance imaging (MRI) brain plain and contrast with angiography was normal. No evidence of intracranial aneurysm [Figure 3]. Cerebrospinal fluid (CSF) analysis showed raised protein (183 mg/dL), hypoglychorrachia (18.1 mg/dL), and lymphocytic pleocytosis (164 cells/mm 3 ; lymphocytes 90%). No malignant cells were seen. India ink preparation and cryptococcal antigen assay was positive. CSF culture was positive for Cryptococcus neoformans. CSF manometry revealed normal opening pressure value of 140 mm of CSF. His cluster differentiation (CD4) cell count was 452 cells/μL. He was treated with intravenous (IV) amphotericin B 0.7 mg/kg/day and oral fluconazole 400 mg daily for 6 weeks. CSF culture at the end of 6 weeks of amphotericin B was sterile. There was partial improvement in the extraocular movement and ptosis. Oculomotor nerve palsy with pupillomotor palsy indicates compression by intracranial aneurysms and tumors. Isolated oculomotor nerve palsy in cryptococcal meningitis is rare. Keane (1993) reported two patients with cryptococcal meningitis and increased intracranial pressure (ICP) experiencing episodic unilateral third nerve palsies seemingly related to transient peaks in ICP. Azran et al., (2005) reported a patient of episodic oculomotor nerve palsy with cryptococcal meningitis. Raised ICP was the cause for the episodic unilateral third nerve palsy. However, our patient did not have features of raised ICP. Cryptococcus neoformans is saprophytic encapsulated yeast with a worldwide distribution in soil contaminated usually with avian excreta, mostly from pigeons. Infection is acquired by inhalation of the organism and could be asymptomatic or limited to the lungs, especially in the immunocompetent host. Multiple cranial neuropathies in association with cryptococcal meningitis have been reported. Mohan et al., (2006) reported a case of cryptococcal meningitis with complete loss of vision and hearing as well palsies of the third, sixth, and seventh cranial nerves in a sequential manner. Inflammation and direct invasion of cranial nerves by the fungus is also thought to be responsible for cranial neuropathies in cryptococcal meningitis apart from the raised ICP. Our patient presented with sudden onset oculomotor nerve palsy with involvement of pupillomotor fibers and we ruled out compression of the nerve by the intracranial aneurysm. The surprising finding of presence of cryptococcal meningitis on CSF analysis in our patient with isolated oculomotor nerve palsy, emphasizes the need of CSF analysis in every patient with isolated oculomotor nerve palsy with or without pupillomotor palsy. Cryptococcal meningitis is one of the etiology for isolated oculomotor nerve palsy with involvement of pupillomotor fibers and is rarely reported in the literature. This case emphasizes the need of CSF analysis in isolated cranial mononeuropathy. 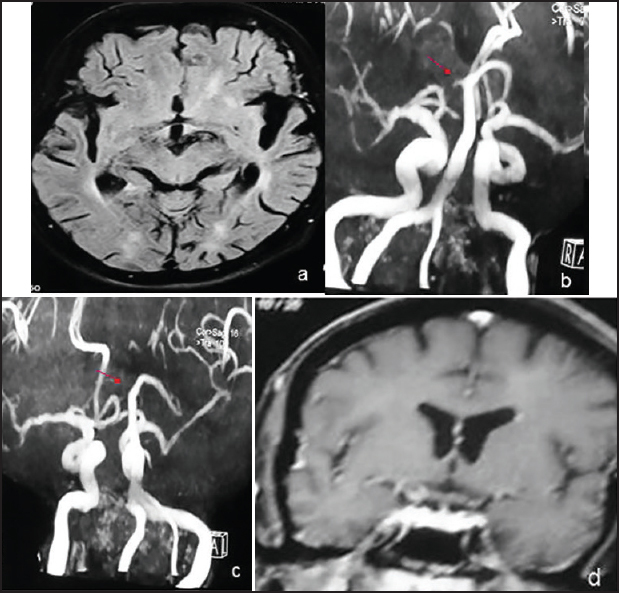 Matsuda R, Hironaka Y, Kawai H, Park YS, Taoka T, Nakase H. Unilateral oculomotor nerve palsy as an initial presentation of bilateral chronic subdural haematoma: Case report. Neurol Med Chir (Tokyo) 2013;53:616-9. Keane JR. Intermittent third nerve palsy with cryptococcal meningitis. J Clin Neuroophthalmol 1993;13:124-6. Azran MS, Waljee A, Biousse V, Frankel M, Newman NJ. Episodic third nerve palsy with cryptococcal meningitis. Neurology 2005;64:759-60. 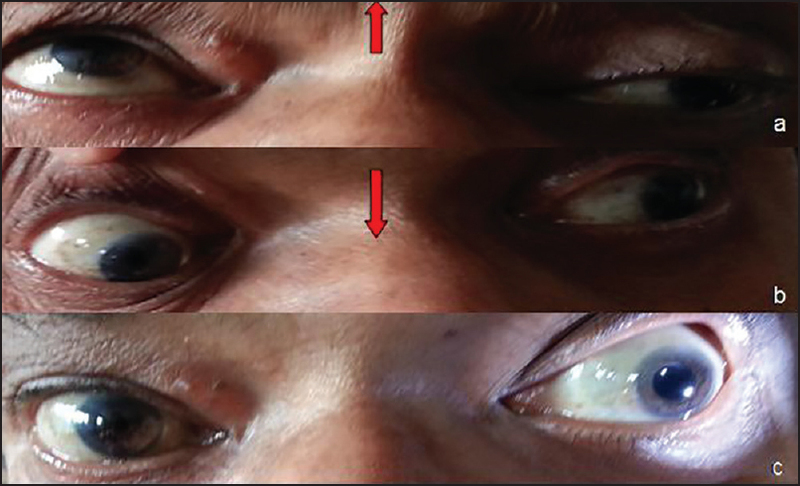 Liyanage DS, Pathberiya LP, Gooneratne IK, Caldera MH, Perera PW, Gamage R. Cryptococcal meningitis presenting with bilateral complete ophthalmoplegia: A case report. BMC Res Notes 2014;7:328. Mohan S, Ahmed SI, Alao OA, Schliep TC. A case of AIDS associated cryptococcal meningitis with multiple cranial nerve neuropathies. Clin Neurol Neurosurg 2006;108:610-3.